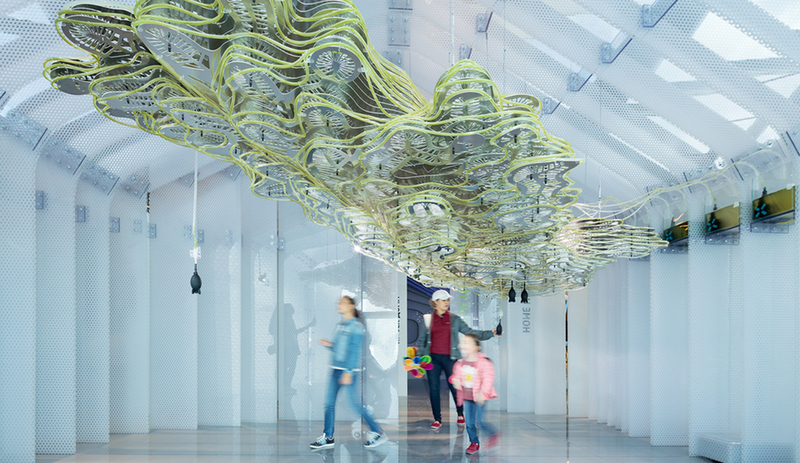 Left: Mason White and Lola Sheppard stand among fabricated discs that make up a portion of their installation on view this summer at the Venice Biennale of Architecture. 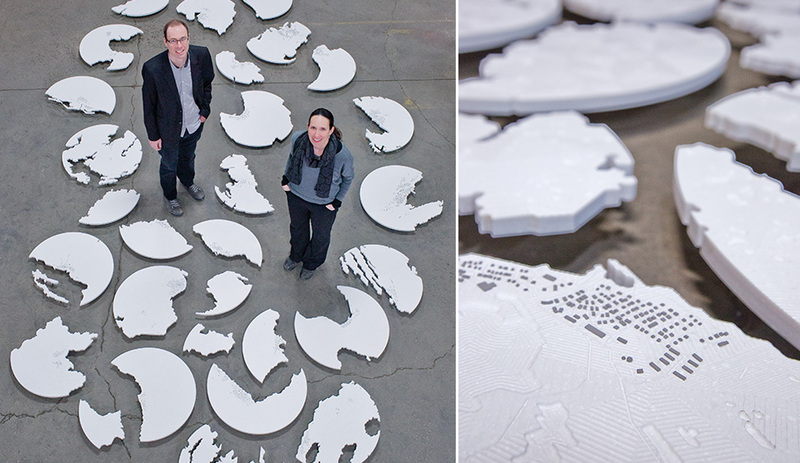 Right: Each disc maps out the streets and buildings of Nuna­vut’s 25 communities. 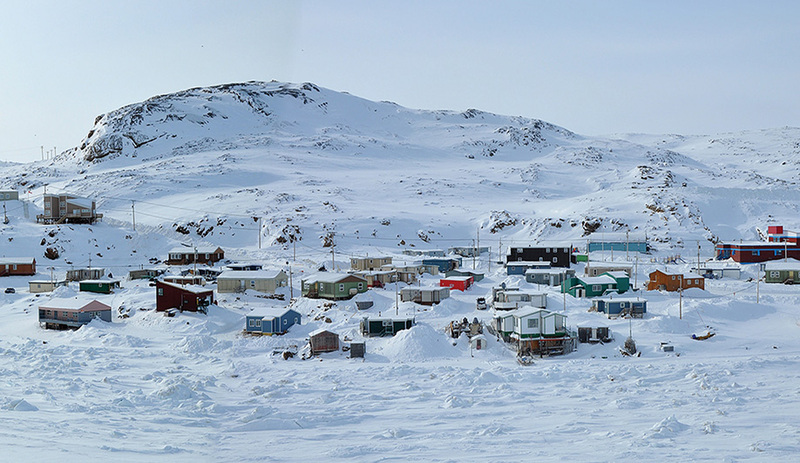 The installation includes panoramic images by Northern photographers, including Billy Aakavak’s photo of Kimmirut, which is located 2,200 kilometres north of Toronto. 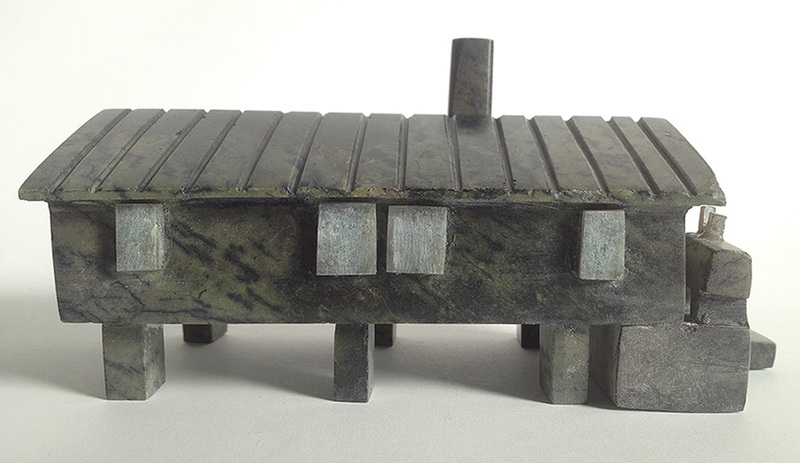 Houses carved from soapstone, on display in the Canadian pavilion, illustrate Nunavut's architectural typologies. Following detailed maps, the Arctic Adaptations team painstakingly adds to each disc tiny models of every structure found in Nunavut’s remote communities. In a warehouse outside of Toronto, Lateral Office staff make final adjustments before crating the show for Venice. Nunavut lies above the treeline, which makes construction materials scarce. 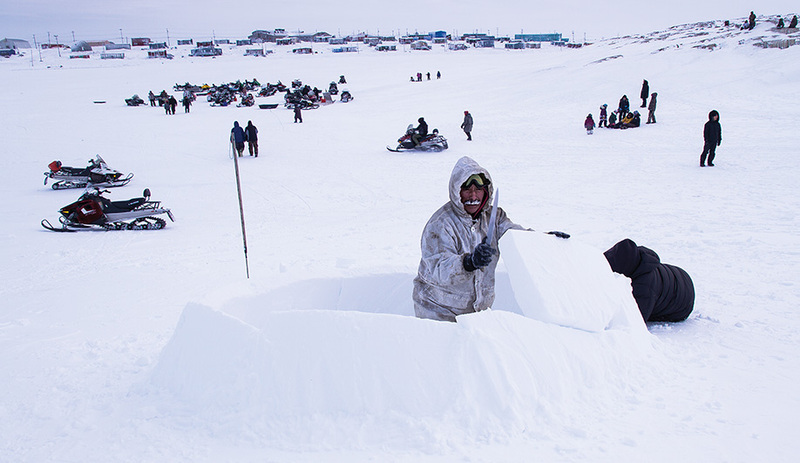 As this exhibition photo by Brad Wutke shows, igloo building remains a time-honoured practice. The Toronto firm, which is representing Canada at the Venice Architecture Biennale, discusses its fascination with Nunavut and how architects can respond to the challenge of building in the north. Nunavut represents over one-fifth of Canada’s land mass, yet just 0.1 percent of the country’s population lives in the northern territory. With temperatures regularly plummeting to minus 50 degrees Celsius in winter, the vast scale and extreme conditions make it beyond comprehension for most of us. To build there seems equally unfathomable. Nonetheless, Lateral Office finds these challenges endlessly fascinating. 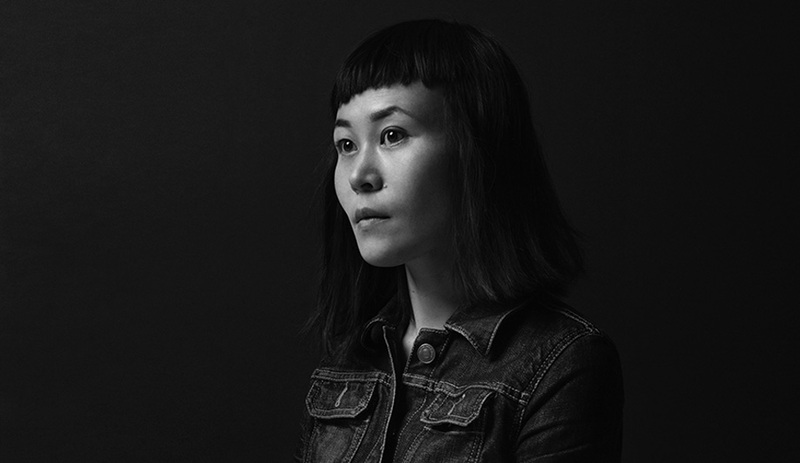 Founded in 2003 by Lola Sheppard and Mason White and now joined by Matthew Spremulli, the Toronto firm is representing Canada at the Venice Biennale of Architecture with an exhibit entitled Arctic Adaptations. In part, it features miniature topographic maps of the region’s 25 communities, each crafted out of Corian, with every building depicted individually. Their goal: to start the conversation about how architects can work in the North, by first demystifying its unique geography and culture. You’ve worked on various Arctic projects, including a master plan for a former airport site in Reykjavik, and an infrastructure concept to support a food sharing network. What fascinates you about the North? Mason White: Its reality is more fantastic than fiction. It’s above the treeline, above the road line; and in Nunavut specifically, communities are spread out and thriving in a dual state between the traditional way of life and the modern one. Most people don’t realize that the region also has the fastest-growing population in Canada. When it was officially renamed Nunavut in 1999, more than half of the current population was not yet born. It keeps revealing something more powerful than any prejudice or assumption. The knowledge we have gained from the North is incredible. We can’t stop. How big is the gap between the public’s perception and the Arctic’s reality? Lola Sheppard: For one, seasonality is huge there, from when you can hunt to when you can buy a new sofa; there is even a season for that. Elsewhere in Canada, if you want to build an extension on your house you can do it whenever you want. That flexibility doesn’t exist in the North, which can be humbling. It’s the one place where you can’t control the environment. You have to collaborate with it, in all respects. M.W. : Northern cities are also compact, with a strong urban density, but as soon as you leave you are out on the tundra. L.S. : There are almost no sidewalks or paved roads. That seems like a small thing, but it’s striking, because it means buildings are on a kind of continuous plane. When everything is covered in snow, the difference between road and private property is erased. What is unique about the buildings in Iqaluit, one of the coldest cities in Canada? The lack of local materials must have an impact. L.S. : Surprisingly, buildings in the North aren’t so different from what you find anywhere else, which is part of why they fail. Some homes are completely snowed under every year, so you can’t get out the front door. There are some innovations: most structures are constructed on piles, because the ground is so topographically varied. In certain communities, such as Iqaluit, the building meets the land at one point and then the land falls away, so you’ll see these buildings that look as if they’re floating. M.W. 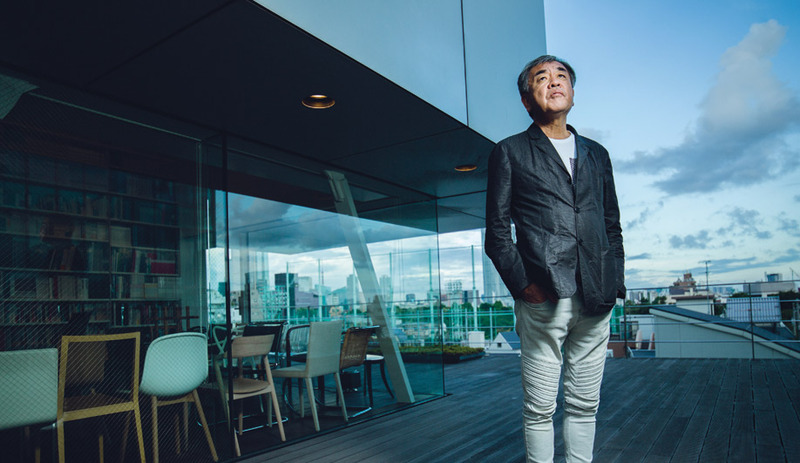 : Materials have always been imported, because not much is available locally, and that has always been considered a technological nut to crack: where is the magic material? In our view, form is just as important. L.S. : Prefab doesn’t offer a viable solution either. Most materials come by air or boat, so storage and transportation of such large cargo can be more expensive than building in slightly more traditional ways. 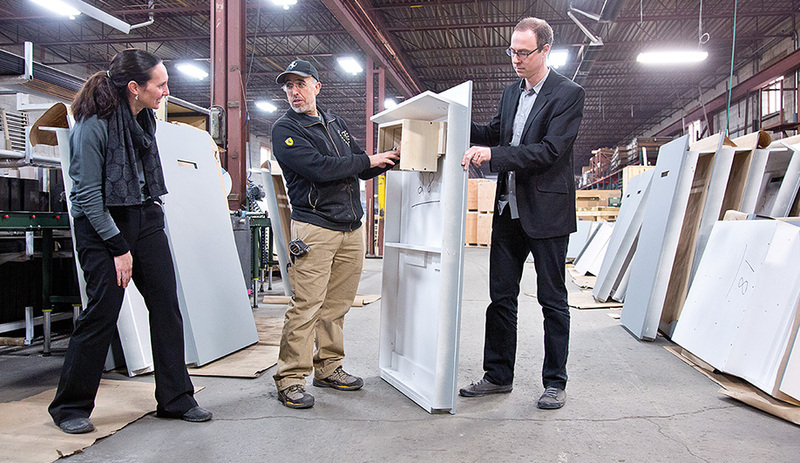 The other challenge with prefabrication is that it has little tolerance; it has to come together pretty perfectly. If something goes wrong in the construction, prefabricated assembly doesn’t allow you to fill in the gaps easily. In an environment with a high level of contingency, that’s a challenge. Have other Arctic countries found solutions that we could import to Canada? L.S. : Scandinavia has a much longer history of settlement, and climatically it’s less harsh. It’s also far more dense, so you don’t have the same distances. You can get around by ship or rail, if not road, even to the most northerly areas. M.W. : Typically, ideas used in the North have been imported from southern Canada, just because it’s internal. We need more northern architects, and many people from the region would welcome a way to celebrate design as a form of cultural expression and sense of place. That opportunity has not happened yet. I can’t hide from the fact that economics is so critical, given the government’s narrow operating margins, but the potential exists to rethink whom you are serving and how. How can architecture successfully respond to the challenges of building in the North – cultural, economic and climatic? M.W. : The culture of sharing is integral to the North. There is constant movement back and forth, of sharing knowledge, food and stories – between a cousin’s house, an elder’s lodge and a sister’s house. Still, the idea has not yet translated into the architecture or the social infrastructure, or even how it can inform the placement of buildings. The ideal architectural model may be a constellation of programs, with facilities doing double duty. Schools, for instance, are often used for various other purposes. L.S. : Arctic College is a good example. It has a building in every community. Sometimes it’s just a basic room, but the college recognized that having a physical presence in the community is important, as a kind of anchor. It’s a more effective approach than the traditional campus, with one emblematic building in one city. We are also thinking about collective infrastructures as a network that can respond to the way people move around: being out on the land, trying to get an education. This sort of networking doesn’t exist right now. If you need a Caesarian section, for instance, you have to go to Montreal. Our previous projects, such as the Arctic Food Network, were partly about us coming to terms with the question of how architecture can adapt to local needs and encourage this type of movement. If you build something in one place, it doesn’t necessarily improve the conditions in another. The idea that things might work more as a network is quite evocative. 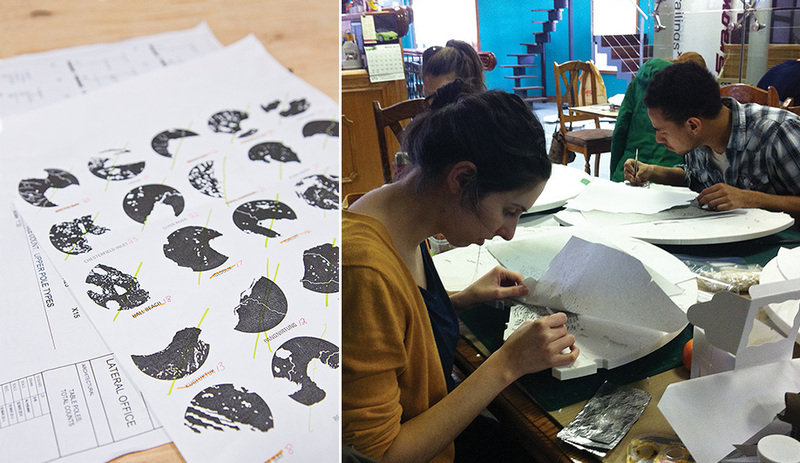 How do these ideas inform your biennale exhibition? M.W. : We hope Arctic Adaptations inspires alternative approaches to problems that might seem as though they can’t be solved because somebody is always saying, “That’s too expensive.” It actually costs more to follow the current path than to change it – not only in cash, but in the costs of social ills. L.S. : It’s not about designing more expensive buildings. Everyone should be willing to experiment, at least within a reasonable margin, so we don’t end up with some of the failures of the past. At the same time, we have to realize that the economic challenges of the North don’t need to be the only criteria. 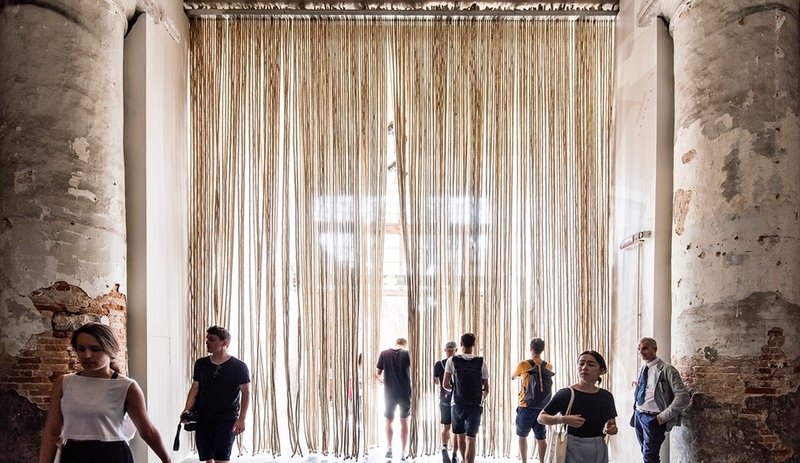 The 14th Venice Biennale of Architecture runs from June 7 to November 23.